Our friend Aranya, over in France, got her hands on the Park 6 set when they released it last Friday (along with the TRON and Sushi set). In it she found this cool variant of the Wet Paint Donald. Makes a lot of sense right? Aranya says they cost 12.95 Euros. Could this be a direct comparison to the price here? 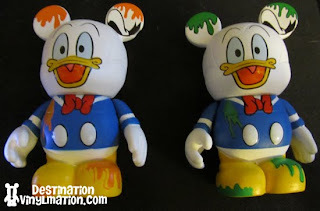 I love the Donald Wet Paint variant! However, there could be multiple colored variants right? Blue, purple? We shall see! I can’t wait until Friday, really looking forward to Park 6! Always a chance…. they are kinda sneaky with that. Right now there’s also a rumor that there’s two different variants of the Monorail in this set. Why are the prices going to be different? Urban 6 was 11.95. I thought that maybe Disney realized that 12.95 was too much. I hope the price is not 12.95. Kind of limits how many someone can buy. That’s just the price they paid in Paris (in Euros), so we’re not sure if that will translate directly on a 1 to 1 basis. As soon as we heard anything about the price in Dollars we’ll post it in an update to this site! I say we count ourselves lucky we aren’t in Europe. If he paid 12.95 EU, that is about $18 USD. I literally gave up complaining on and off about the pricing anymore. If park 6 would end up as 12.95 each, it would be very obscure and totally not fair for a regular blind box/newcomer. The chaser and the variant shown so far for this series is great, but still what is going on the marketing teams minds with pricing, they are crazy and for the ducktales and future disney afternoon set the price will be once again 26.95, two dollars more than the original advertised price of 24.95 for the tailspin set, not to be though lol.